Don't Be a Complete "Green Horn"
Do You Know the Parts of a Horse? Where Will You Be Keeping Your Horse? "Horse information to learn about buying a horse, feeding a horse, health needs, shelter, pasture, and space requirements." What does a horse need? Food, space & shelter, health care. This site is committed to serving horses and their owners or soon-to-be owners. Lots of helpful horse information is crammed in here to immediately provide owners with horse care facts to help you understand the responsibilities of caring for a horse. Informative guidelines on horse needs such as feeding your horse, horse boarding and horse shelter, health needs, and horse information in general. Lots of great horse information with practical tips can be found here with additional links to other instructive horse information from hand-picked selected quality sponsors where you can find more terrific and reliable expert advice that you need. Discover the difference having a horse can make. Horse ownership is guaranteed to delight, but without the benefits of having a professional or skilled horseman around to provide you with horse information and to help guide you, it can be a bit daunting at times. Owning a horse definitely merits research on what is required to properly care for your horse so you have knowledge that can be quickly drawn upon as needed. Check this site frequently for horse information as it is updated often. What you need to know when buying a saddle. 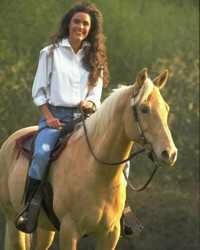 A horse saddle, regardless of type, must fit both horse and rider. Bridling a horse is not as easy as it may seem. If you do it incorrectly, it may be become traumatic for the horse. The rider may be affected or injured as well..
Snaffle bit or curb bit? Know the difference in horse bits. Horse owners on occasion may be required to give their horse vaccines that are administered through an injection, such as protecting your horse from the West Nile virus. Giving your horse a shot is not difficult to learn. An element of good horsemanship is knowing the basic parts of your horse. Don't be a complete "green horn" around your horse -- know your horse's basic anatomy. Costs to maintain this site are met entirely through ads and your kind donations. If you find this horse site enjoyable and useful, and would like to help us keep it running, please click on the button to make a small donation.